Powers/Abilities: Vess is a talented writer. He previously adopted werewolf form, presumably with the standard werewolf strengths (enhanced strength, speed, senses, agility, reflexes, and healing) and vulnerabilities (silver, wolfsbane, magic, need for moonlight to remain in wolf form). It is not clear whether he refuses to adopt werewolf form or whether he is no longer able to fully transform, but he has not transformed in "a very long time." 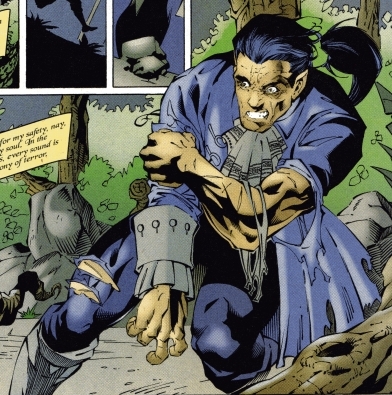 (Wolverine 1999 (fb)) <1760 AD> - In the New York colony, Duncan Vess was attacked by a Werewolf, escaping with his life by cutting off his pony-tail, by which the werewolf held him. (Wolverine 1999 (fb) - BTS) - Duncan Vess became a werewolf. (Wolverine 1999 (fb) - BTS) - Long ago, Duncan Vess forsook his heritage and went to live among the human race. (Wolverine 1999 (fb) - BTS) - In the 21st century, Duncan Vess was the author of the successful Werewolf Chronicles novel series. (Wolverine 1999 (fb) - BTS) - The Council of Werewolves, angered at Duncan's betrayal but not wishing to draw attention to werewolves, hired the mercenary Deadpool to kill him. Unaware of this, another werewolf, Lycus, targeted Vess for death himself despite the Council's apparent instructions. (Wolverine 1999 (fb) - BTS) - Kitty Pryde, a big fan of Vess' work, sent Wolverine to a book signing for Vess' newest novel, Blood Moon, to have her copy autographed by Vess. (Wolverine 1999) - Wolverine approached Vess for the signing, and both men recognized the other's feral nature. Wolverine asked Vess how he knew so much about werewolves, and Vess answered that he had been blessed with a generous muse, then promptly departed and rushed back to his brownstone, unaware that he was being stalked by both Deadpool and Lycus. Either Lycus or Deadpool cut Vess' home's power, and while Lycus confronted Vess in the darkness, Wolverine ambushed Deadpool, preventing him from entering Vess' house. Apparently distracted by the commotion caused by Deadpool and Wolverine's fight, Lycus left Vess behind to go after them. While Wolverine and Deadpool temporarily trapped Lycus outside Vess' house, Vess revealed his origins to Wolverine, but he refused to (or wasn't able to) transform into a werewolf to help the battle. When Lycus broke in and occupied Wolverine again, Deadpool took Vess away to kill him with a silver dagger. At Deadpool's prodding, Vess tried to turn into a werewolf, manifesting fangs and pointed ears. As Deadpool prepared to finish him off, the Council of Werewolves secretly arrived. Lycus swatted away Wolverine and then Deadpool, then cornered Vess, but the Council arrived and stopped him. Revealing that they had wanted Vess' death to look like a human crime. 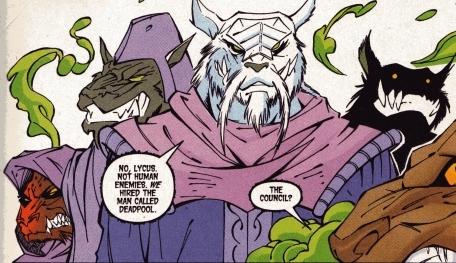 Noting that Lycus' actions could have done more damage than Vess' books, the Council transformed Lycus fully into a wolf. The Council then prepared to destroy Vess for having forsaken the wolf for the man, but Wolverine stepped between them. As dawn was approaching, the Council realized they did not have time to battle him. They teleported away, telling Vess that when next the moon was full that he should be far away from his home and his life as a writer...and that they would have an eternity to hunt him. Vess noted that he could not live in the way of his tribe, nor was he allowed to live as an ordinary man. He planned to seek a quiet, remote town where he could simply be..."sometimes, that is all any of us can hope for." Comments: Created by Marc Andreyko, Walter McDaniel, Walden Wong, & Scott Koblish. The italicized flashback is summarized from a passage from Blood Moon, one of Vess' Werewolf Chronicles novels. It is told as if Vess was the character in the novel, and he may have been, though this is not confirmed. It would fit that a scratch from that werewolf is what caused him to become a werewolf, but again, unconfirmed. Also unconfirmed is the fact that Vess may just have been an alias, as he may have taken several aliases over the centuries to prevent others from realizing his true age. Lycus calls him "Duncan Vess" in quotes, but that may be because Lycus considered his human self to be false. In the 18th century, the USA's werewolf population began increasing significantly as werewolves from Europe settled across the ocean, some of them disguising themselves as normal wolves to elude detection. Devoted werewolves established the Council of Werewolves to monitor their people's activity, and the council took a dim view of those werewolves who chose to marry a human or renounce their wolfen side. The werewolf who became Duncan Vess renounced his wolfen heritage for centuries and thought the Council had forgotten about him. In the 21st century, when Vess became the popular writer of the Werewolf Chronicles novel series, he came to the Council's attention. While certain werewolves, such as Lycus, wanted to personally slay Vess for his perceived betrayal, the Council forbade this, not wanting to draw further attention to werewolves. Instead, they hired the mercenary Deadpool to kill Vess, to make it appear to be a human crime. When Lycus went after Vess anyway, the Council confronted him, noting that he could have done more damage than Vess' novels. Noting the crime of having allowed his animal side to have obscured his human side and having broken the Council's law, they transformed him fully into a wolf. They then prepared to destroy Vess themselves, but Wolverine stepped between them. As dawn was approaching, the Council realized they did not have time to battle him. They teleported away, telling Vess that when next the moon was full that he should be far away from his home and his life as a writer...and that they would have an eternity to hunt him. Four members of the Council were seen, though none were identified by name. It is unrevealed whether these four represent the Council's full membership. 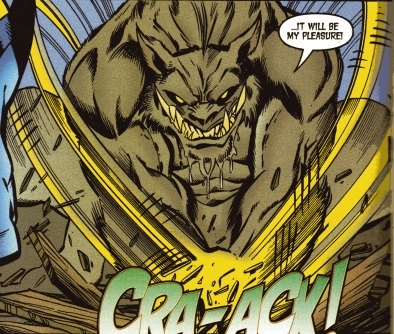 In addition to conventional werewolf attributes, the Council can teleport, transform werewolves fully into wolves, and destroy others (or at least werewolves). They were still limited by the presence of the moon for power. It is not revealed whether they weaken without the moon or, more likely, revert to human form when the moon is absent. Enraged at Vess' abandoning his werewolf heritage, Lycus disobeyed the Council's orders not to hunt him down himself. Confronting Vess in his Manhattan brownstone, Lycus was distracted by Deadpool and Wolverine battling just outside. Lycus attacked the pair, but Wolverine, after learning the hard way that Deadpool's swords weren't made of silver, temporarily barricaded Lycus outside the building. When Lycus broke in again, he battled Wolverine anew, eventually striking Deadpool and Wolverine down long enough to confront Vess himself. The Council then appeared and stopped him from killing Vess, noting that Lycus could have done more damage than Vess' novels. Noting the crime of having allowed his animal side to have obscured his human side and having broken the Council's law, they transformed him fully into a wolf. Lycus wasn't seen again...possibly the Council transported him into the wilderness somewhere. Or maybe he fled the building and then either escaped into the wilderness, made his home in the city somewhere, or was captured or killed. As a werewolf, Lycus presumably with the standard werewolf strengths (enhanced strength, speed, senses, agility, reflexes, and healing) and vulnerabilities (silver, wolfsbane, magic, need for moonlight to remain in wolf form). As a wolf, he presumably had the standard abilities and limitations of a regular wolf.